All transactions are safe and secure with a reliable history in online purchasing behind each of our associates. Buy the What a Star Lucy t-shirt to own I Love Lucy clothing and merchandise. If a real superstar exists, then it is Lucille Ball. Whether Lucy is stomping grapes in a vineyard, singing a duet with her best friend Ethel Mertz, or dressing up in a rumba costume to remind Ricky of his childhood, she always stands out in a crowd. This light blue merchandise item reminds us that she is a star who was larger than life and is sure to get some glances. 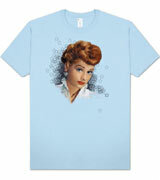 Grab one of these star studded I Love Lucy t-shirts to add to your collection today. In addition to the What a Star Lucy tee above, browse the I Love Lucy Clothing Gallery for more apparel like men's and women's clothes, kids shirts or hoodies.